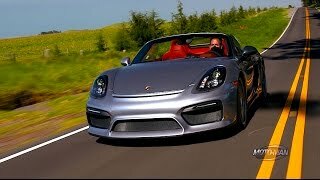 After coming up with their track focused Cayman GT4 and 911 GT3 RS at the Geneva Motor Show, the team Porsche revealed their most powerful and quickest Boxster Spyder at the 2015 New York Auto Show.History to this particular nameplate dates back in 2009, when it was first launched at Los Angeles Auto Show as a roadster inspired by 1960s 718 Spyder. 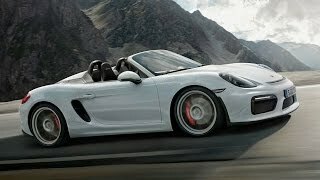 Since then the Porsche team has well maintained the status of their, now the curious car lovers are looking for, if the all-new 2016 Porsche Boxster Spyder will live up to its predecessor’s cult status and if it has the mark to stand out in a line, making a way amidst its competitors like the 911 GT3 and the Cayman GT4. Let us begin with the specifications outline and than further to follow is a deep descriptive analysis of this new Spyder by Porsche. The features and the history stand as proof of Spyder being the most powerful boxster till date. Still speed isn’t all what today’s driving generation and the competition prevailing in market, can let a vehicle stand. The makers also need to work out some techy and catchy interiors and exteriors. Keeping the same now is the right time to see if the new Spyder 2016 has the traits of being the heartthrob of streets. This time the Porsche Spyder 2016 has slight of changes in its cabin. They took off the features that are not required in a track car, like that of AC and Radio. However you can order these two features as no cost options. Isnt a bad deal we believe. Apart from this the team has this time shorten the steering diameter by 0.4 inches, giving it more of a sporty look. For the rest of the interior of Porsche boxster spyder, it narrates the traditional lullaby. Now this is hard to say if the minimalist interior of the Spyder interests the users or not but we do suggest you that while getting the keys just go through the respective boxes and see if the Spyder is living the mark you expect it to. 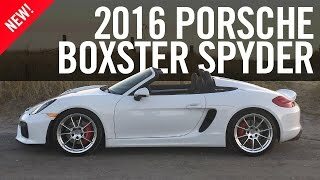 The initial distinctive design of the Boxster Spyder 2016 has been carried out well in this model too the flying two buttresses behind the seat are mark of it. Porsche has added lightness to this model with manually operated top, which indeed is an unmistakable feature of Porsche boxster Spyder 2016. The features can be noted borrowed from the Cayman GT4 like, the racy front, rear fascias and slim air dam in front of the forward baggage compartment. The Spyder also has larger air inlets and also the apron employs a new splitter. At the back the spoiler turns a bit larger in between the tail lights, while the apron at back holds two diffuser like elements adding well to the model. We don’t find a special need here to mention that the exteriors of the new Spyder will tickle your right bones. 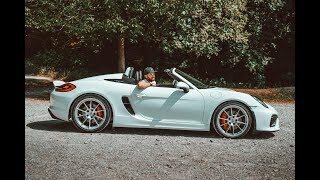 For this segment taking a leap beyond the above stats we would just say the heritage has been well maintained and finally the Spyder has now turned to be the first ever Boxster, which is more powerful and quicker than the base 911 carrera.